We all love to wonder what it must be like to win the lottery. It’s for this reason that winning the lottery has featured in quite a few television shows and movies. Can you remember any examples of the lottery in a show? If not, we’ve put together a few memorable lottery-based scenes, plots and blockbusters. Feel free to pick your favourite moment and play the lucky winning lottery numbers that we’ve added to the clip! Winning numbers: 10, 18, 19, 34, 45, 49. If there was ever a television moment with tons of lotto excitement, like the one the world genuinely experienced on Powerball in January when the jackpot reached a manic $1.6 billion, it was during an episode entitled “Lottery Fever”. Peter Griffin got sent into an ill-advised lottery ticket buying frenzy. What happens is that the dysfunctional family win the lottery, go on a ridiculous spending spree, go broke, win again and yes you guessed it, go broke again! Sounds like some genuine lotto winners like Michael Carroll who after winning 10 million pounds in the UK National Lottery, the “King of Chavs” lost the whole lot and had to reapply for his job again. Winning numbers: 6, 20, 34, 36, 52, 59. In the Breaking Bad episode, “Buried” Walter White, the chemistry teacher who’s diagnosed with cancer, and who’s now cooking crystal meth to make sure his family have enough money to live off after he dies buries barrels of cash in dessert and writes down the co-ordinates, +34° 59′ 20.00″, -106° 36′ 52”. So as not to make it obvious that they are indeed co-ordinates to literally millions of dollars, Walter White plays the numbers on a lottery ticket and puts the lotto ticket on the fridge. Winning numbers: 9, 18, 33, 35, 42, 2, 4. Now we all know that you have to be 18 to play the lottery, but tell Willy Wonka that! He hid a few Golden Tickets inside his famous Wonka chocolate bars, and those fortunate enough to find one in the tasty bar of chocolate, would win a tour of his top-secret Chocolate Factory! 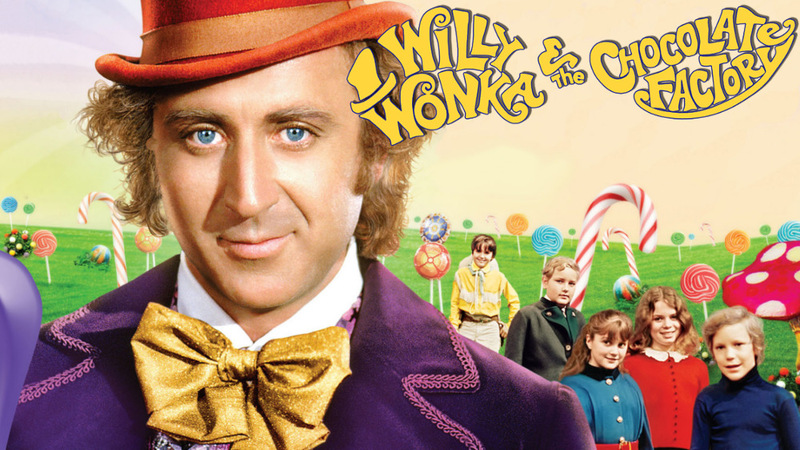 The role of Willy Wonka was first played by Gene Wilder in 1971. RIP Gene Wilder. Winning numbers: 1, 12, 42,44, 46, 59. Winning numbers: In an episode of Friends, the group end up loving the lotto and play, when Phoebe experiences psychic visions that they are going to win. Unfortunately, she tips the basket of tickets off of the balcony on to the street below during a squabble about the prospect of having millions of dollars. This just proves that it’s once again better to play the lottery online! Winning numbers: 7, 13, 34, 45, 47, 50. This ones based on a true story! In “It Could Happen To You,” Nicolas Cage a NY cop realises that he has no money to tip the waitress, so he shows her his lottery ticket and tells her that if he wins, he will share the prize with her. As luck will have it – he wins! He’s not completely out of the woods though, as he is now caught between his promise to the waitress and his annoyed wife. Winning numbers: 2, 16, 18, 22, 27, 31. Imagine taking over God’s duties? Can you for one minute just imagine how many people are praying to win the lottery? Well this happens in Bruce Almighty, when he gets bombarded with requests via email, forcing him to automate a response. With just a few clicks he really did answer millions of lottery prayers simultaneously. Winning numbers: 7, 14, 15, 17, 31, 42. What would you do if your mate wins the lottery and immediately dies of shock? Well, in Waking Ned Devine, his friends decide that it’s a darn good idea not to let their friend’s good-fortune go to waste. 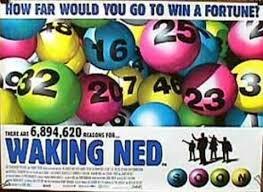 Only one problem… Ned the lucky lotto winner needs to be alive to claim the winnings. Think Weekend at Bernies and you will be on the right track, as his mates claim the win by going to extraordinary hysterical lengths to the lottery inspectors that Ned is in fact alive. If you too would like to hit the jackpot and ride off into the sunset as if you too were in some Hollywood television show, then we suggest you play the lotto online right here at PlayHugeLottos.com! If by some strange chance they are still not big enough, then you will have to wait one more day to find out if you have won, by playing this Wednesday’s gigantic $154 million USA Powerball draw! So if you haven’t done so before it’s the perfect time to play the lottery online! after winning in lottery jackpot, my winning moments will be telecast at television throughout the WORLD very soon, i have full trust on GOD and myself also. television is a great medium to see interesting things LIVE throughout the WORLD, like publish my winning jackpot news, one after another !! For TV Jackpot winnings are indeed news worthy. every morning , after waking up i switch on of TELEVISION and hope my name should be declared about winning of big LOTTERY !! Thanks for all the numbers!